Our security seal “SECUR” is a one time use pull-tight security seal. This type of seals allow the user to cinch-up the seal according to the specific size requirement. This seal is self-locking which features an ultrasonically sealed tamper-proof cap. 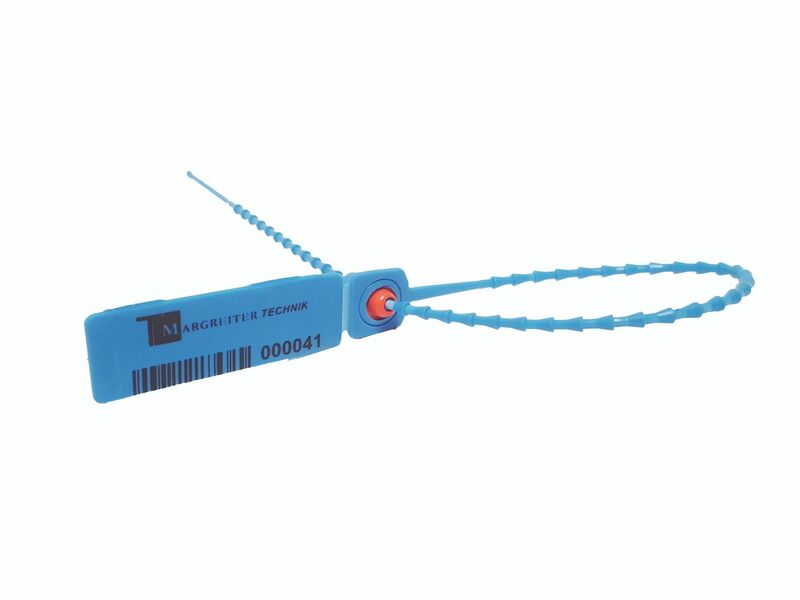 Variable length plastic strap seals are ideal for use when one seal type is used to secure multiple items or when the same item can vary by size. Our cinch-up seal is durable, weather resistant and withstands extreme cold and heat. Our pull-tight seal can be used in various industries – Healthcare, retail, airlines, cash-in-transit operations and of cause cargo and freight industry. With a diameter of the cable of only 3 mm, this seal is suitable for many applications for small drillings. The strap seal “SECUR” is available in two different lengths and in various colours. On stock, we usually have the colours orange with black imprint and blue with white imprint. Any seal has a consecutive number preprinted. Our security seal “SECUR” can also be preprinted with your company name or other information additional to the consecutive number. Starting with a minimum order quantity of 10.000 pcs, our seals can be supplied with an individual printing without any surcharge.